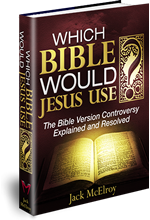 Reviews - Which Bible Would Jesus Use? - Which Bible Would Jesus Use? ––Dr. Peter S. Ruckman Author of over 100 Bible related books and pamphlets. ––Gail A. Riplinger Author of Bestsellers: New Age Bible Versions; In Awe of Thy Word;The Language of the King James Bible; Which Bible Is God’s Word? Amazon Customer Reviews of Which Bible Would Jesus Use? I’ve read dozens of books addressing the “Which Version” question. This one stands among the best. I appreciate McElroy’s unique approach to this topic: Asking the question — what Bible version would Jesus use if he preached in your church today? — and providing a clear and reasoned answer. This book also addresses the common “gotcha” questions supposedly too hard for KJB believers to answer, like “what about the differences between the 1611 and 1769.” A good read for someone new to the issue or a veteran on the topic. I was listening to radio program and the host is always talking about the bible says this or the bible says that in a definitive manner yet a caller called in and then the host started talking about how the original manuscripts were perfect etc yet choose a translation blah blah yet how can he tell somebody what the bible says if he doesn’t even know himself if his bible is the right bible? Doesn’t it make sense that God actually preserved his word perfectly no matter how many men tried to mess it up? The King James bible is the one that God used the last 400 years 760 + languages and is obviously the one Jesus would use, READ THIS BOOK FOLKS The true bible does exist after all and this book makes it clear which ONE it is. I got this book from John Davis, (Time For Truth) in UK. It is not on Amazon UK. It is serious in its attempt to find which of the hundreds of English bibles Jesus would use if he were to come to church today. His picture of Jesus coming to church with a wheel barrow full of the original autographs (for the original manuscriptolaters), who believe only the very original writings were and are inspired; and trying to fit them into the covers of a book, then preach from them: is hilarious. He then goes through various popular versions testing them with known errors of the textual critics and two heretical readings: John 7:8 (the omission of yet in modern bibles, making Jesus a liar) and Matt 5:22 (without a cause omitted, making Jesus an angry sinner); among others. He then has a few chapters dealing with the bible before 1611. Differences between the 1611 KJV and the various KJV “editions” and supposed revisions: the oxford and Cambridge “edition” for example. Then a few chapters on inspiration and preservation. I am really enjoying it and although I think mainly convinced bible believers will read this book I think it would also suit people who don’t want something too simplistic but aren’t up to the strong meat of Riplinger, Ruckman, Hills, Grady, Cloud, Burgon and others. Jack has a unique way with words. His explanations and arguments have finally settled the issue for me! Thanks Jack!